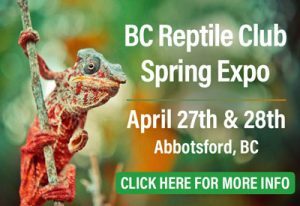 The BC Reptile Club (BCRC) is a provincially registered non-profit organization that advocates for exotic pets and their keepers. The club was formed in 2009 to give reptile keepers across BC a unified voice in lawmaking proceedings related to the hobby. Since then, the club has expanded to meet other needs of the community, including hosting a bi-annual reptile expo, encouraging and pushing for high standards in care and husbandry, and assisting non-profit rescue groups in any way we are able to. We encourage you to learn more about us on our information page. If you are interested in what we do, please consider strengthening our community by becoming a member. We welcome any feedback and questions, and invite you to get in touch with us through email or on Facebook.